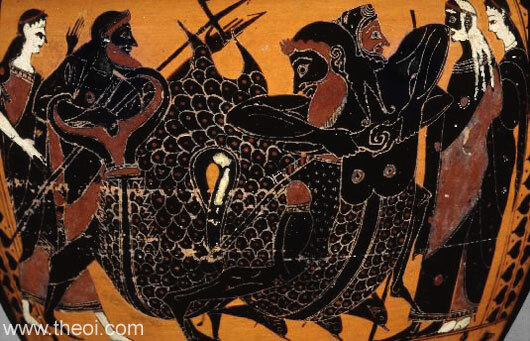 Heracles wrestles the fish-tailed sea-god Triton. The deity has the head, arms and chest of a man with the serpentine tail of a fish in place of a lower torso and legs. A row of three, small dolphins dive beneath him. The hero wears a lion-skin cape and grasps the god about the chest. The wrestlers are surrounded by four figures--Poseidon, holding a trident, and his wife Amphitrite on the left, and her parents Nereus, the old man of the sea, and Doris on the right. The main figures of this scene are labelled on a similar vase from the same period (see image P10.1).